Financial difficulties have halted development of the ambitious Whore of the Orient. Team Bondi, the development studio behind the 2011 detective thriller L.A. Noire, has had a troubled past, and the future doesn't look much brighter right now. Though the game was met with critical and commercial success, the studio was plagued with controversy over working conditions and the team's relationship with publisher Rockstar. After Team Bondi formally closed and was sold to a multimedia production firm, the development team starting working on a new title, Whore of the Orient. Now reports are saying that Whore of the Orient is on indefinite hold following a wave of layoffs. It's unclear how many employees still have their jobs, but the studio itself has not shut down. The team was never able to secure a publisher for the game, so the studio's financial troubles may have led to the halt in development. Sources say that Warner Bros. dropped an unannounced publishing deal with the team, leaving the game unfunded. Still, there may still be hope: Doug Mitchell, one of the bosses of the company that acquired Team Bondi, is still pushing to see the game to completion. "Whore of the Orient is a unique and extraordinary story and game," he says, "and we are still actively pursuing the right investor to partner with." Whore of the Orient was planned to be a spiritual successor to L.A. Noire. 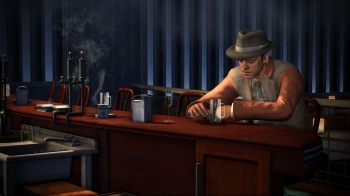 Set in 1936 Shanghai, the game would be another detective thriller (likely using the same facial-capture technology as L.A. Noire). The developers clearly believed in its potential, with studio head Brendan McNamara describing it as the story of a group of Western cops trying to keep the peace in "the most corrupt and decadent city on the planet." If a publisher for the game is found, it's possible that the team will be brought back in to resume development soon. It's an unfortunate reality that many games never recover from this kind of interruption, but then again, Whore of the Orient isn't like many games. For now, though, the project is frozen at a standstill.